How is Property Tax Determined? There are numerous benefits of owning a house but there are also some disadvantages. One of them is a real estate property tax. It is charged across the country and represents one of the biggest portions of revenue for local governments. Property tax (including residential, commercial, and industrial) are common all over the world and have been collected for centuries in different forms. With the arrival of the Europeans in America, property taxes have become part of physical property ownership. To the benefit of homeowners, federal, state, and local budgets are less dependent on property taxes, which favors property owners and provides more stability in real estate market. Each local government decides on the tax rate based on its budget requirements and compares that to the value of real estate located there as determined by the assessor. Because the budget and property values change, governments can set different rates each year. Additionally, different properties can pay different rates depending on their classifications. 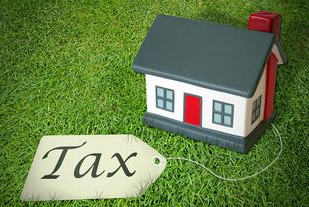 Commercial properties may be taxed at one rate, and residential properties at another. 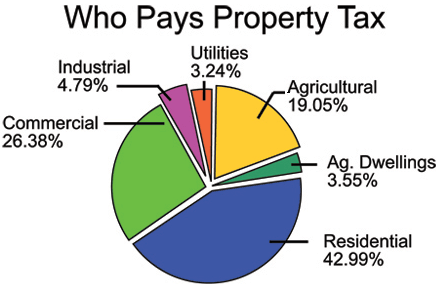 What’s the purpose of paying property taxes? In order to finance different services, local jurisdictions access a tax on the property owners. Proceeds are distributed among schools, police and fire departments, maintenance of roads, parks, museums, libraries, or payments to city workers. There are usually several jurisdictions (county, city, school district, water management, etc) that receive a portion of the property tax, but the homeowner pays just one amount. Tax amount depends on the value of a property; it is therefore an ad valorem tax. In general, when a tax assessor appraises a home that amount becomes a basis on which property tax is calculated. Sometimes that amount is lowered by the cost to bring the property to the market for sale and exemptions, if any. It is then multiplied by the property tax rate than varies from county to county and typically oscillates between 1 to 4 percent. Property tax payment is due either with your mortgage payment or at the end of the year. Semi-annual payments are also common. Consequences of not paying property tax. Due dates are set up well in advance and if you happen to miss it, you should expect a penalty. The penalty is usually in percentage terms and is often accompanied by a fixed fee. On the flip side, some counties offer discounts for early payments but this is not a rule. You have to check the details with the appropriate Treasurer and Tax Collector’s office. If the tax payment has not been made for extended period of time, the property may become tax defaulted, an event that triggers much stiffer penalties. The worst-case scenario is for a property to be in default for several years at which point it may be auctioned off. If for economic reasons you are unable to make property tax payments, contact the Office of the Treasurer and Tax Collector and try to negotiate some type of arrangement, i.e. lower payments until you get back on your feet. Contacting the office is highly recommended if the property is in default. For more information contact your local Treasurer and Tax Collector Office or your county property tax portal.